This amazing pecan cracker is powerful enough to crack up to 50lbs of pecans per hour while still being portable enough to fit into the bed of a truck for mobile cracking. Constructed of durable industrial grade materials and primed mild steel, this cracker in an investment that will pay dividends for many years to come. This nutcracker has a 120-volt gear motor that turns a rotor inside of a cage. No need to worry about over or under cracking - our cracker is easily adjustable for nut size. Depending on nut freshness, the majority of pecans are cracked out of shell in halves. English walnuts, peanuts, almonds and hazelnuts are also 85% or better out of shell. Includes safety features such as auto off in overload situations as well as GFCI shock protection. Easily maintained with yearly greasing of bearings. Weighs 150 lbs. 40" tall x 23" long x 24" wide. Freight shipping (included in price). 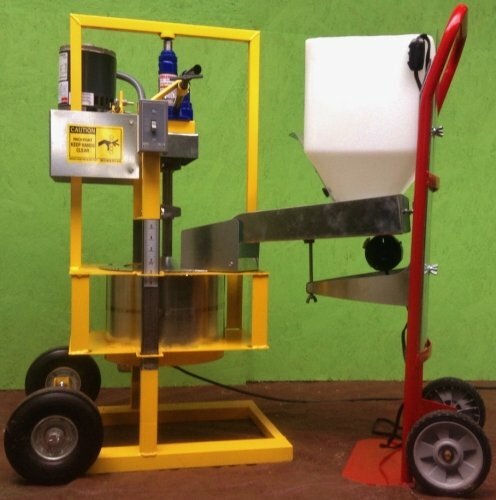 Manufactured here in America, the 50lb Cracking Machine is made with industrial grade materials. It has a mild steel that has been primed and painted with an oil-based paint. This makes it require minimal maintenance for heavy use, and helps it to endure the elements as the years go by. The bearings only need to be greased yearly.